The calving front of Jakobshavn Glacier, center. Credit: NASA/OIB/John Sonntag. It’s become the familiar refrain in this era of climate change: Warmer temperatures, retreating glaciers, and rising sea levels. But when it comes to Greenland’s Jakobshavn Glacier, it seems the drumbeat of disaster may have halted—for now. Scientists report in the journal Nature Geoscience this week that the once fast-retreating ice sheet has been thickening over the last few years instead. It’s a reversal of a twenty-year trend of thinning and retreating, but perhaps not for long. Ala Khazendar, researcher at NASA’s Jet Propulsion Laboratory, joins Ira to explain why this glacial about-face may not be the cause for celebration that we think it is in this week’s Good Thing, Bad Thing. Read the original press release from NASA’s Jet Propulsion Laboratory. Learn more over at Motherboard. Model your own glaciers with this activity from Science Friday Educate. Ala Khazendar is a glaciologist with the NASA Jet Propulsion Laboratory in Pasadena, California. Because every story has a flip side, it’s becoming a recurring refrain in this era of climate change– warmer temperatures, melting glaciers, rising sea levels, repeat. But when it comes to Greenland’s Jakobshavn Glacier, it seems that cycle of disaster may have halted. 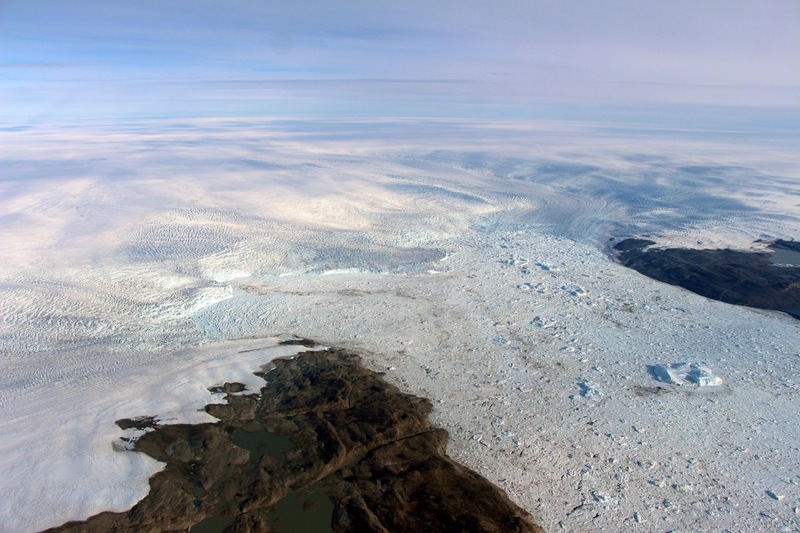 Stunned scientists report in the journal Nature Geoscience this week that the ice stream which had been retreating for two decades has instead been thickening over the last few years. So why isn’t it a cause for celebration? Joining me to tell us all the good and the bad of the glacial about-face is Ala Khazendar, glaciologist with NASA’s Jet Propulsion Laboratory. Dr. Khazendar, welcome to Science Friday. ALA KHAZENDAR: Hi, Ira. Thank you very much for the opportunity to share our findings. IRA FLATOW: Well, Dr. Khazendar, how surprised were you to discover that after 20 years of melting, one of the Greenland’s fastest melting glaciers has actually been growing? ALA KHAZENDAR: It was quite a surprise because over the past few years, when this glacier was being studied intensively along with many other glaciers around Greenland, the expectation was that it would continue doing what it has been for the last 20 years, which is retreating, accelerating, and thinning. And there are factors about this glacier that supported the assumption that it would continue this behavior into the future. IRA FLATOW: OK. So what has caused the glacier to grow instead of shrink over the last couple of years? ALA KHAZENDAR: So this has been really a natural experiment, 20 years in the making. It started in the late 1990s, when scientists at that time detected the arrival of warmer waters in the vicinity of Jakobshavn. And soon after that, the glacier started this retreat, acceleration, and thinning. It had a floating ice [INAUDIBLE], or an ice shelf, that was something like 15 kilometers long that completely disintegrated by 2003. Our own measurements show that the thickness of the glacier was reduced by 160 meters, or almost more than 500 feet near the front. So what we detected now is basically the reversal of what happened all that time ago, which is arrival of cooler waters in the vicinity of the glacier. And we hypothesize that this reverse, the processes involved, and resulted in the re-advance, the slowing down, and the thickening of the glacier. IRA FLATOW: So why this arrival of the cold water? Is this permanent thing, temporary thing? ALA KHAZENDAR: Unfortunately, we strongly suspect that it is a temporary reprieve than a resurrection of the glacier. It is most likely connected to a cyclical phenomenon, something called the North Atlantic Oscillation. And the water warmers will be coming back. IRA FLATOW: Isn’t that sort of like an El Niño sort of thing, like we have in the Pacific and oscillation then? ALA KHAZENDAR: They are cousins. You mean it’s the same kind of change in the water temperature? ALA KHAZENDAR: Yes. I mean, it’s an atmospheric phenomenon that affects also the circulation of the ocean, the temperatures of the ocean, the heat exchanged between the ocean and the atmosphere, and so on. IRA FLATOW: How long do we expect this to last then? ALA KHAZENDAR: I don’t think anybody knows. It could be back to doing what it did in the coming two years or so. Or it could take a bit longer. But we know– and this is the bad news, part of it– that most of the heat added to the atmosphere mostly due to human activity is actually absorbed into the ocean, more than 90% of it. So there is a high probability that when the warm waters come back again, they will be even warmer. IRA FLATOW: So that will re-melt the glacier? ALA KHAZENDAR: Yes, and there is something very– about this glacier that makes it even more vulnerable. The bedrock on which it lies low is beneath sea level, and it deepens the further you go inland, which means that this warm embrace between the ocean and the glacier will continue for decades to come. And we have demonstrated how sensitive it is to the warming of ocean waters. So this implies that this retreat might continue– most likely will continue for decades to come. IRA FLATOW: Thank you Dr. Khazendar for taking time to be with us today. ALA KHAZENDAR: You’re most welcome. Thank you very much. IRA FLATOW: You’re welcome. Ala Khazendar, glaciologist with NASA’s Jet Propulsion Laboratory.